Windstar’s 212-guest Star Legend sails to dozens of harbors in Japan, China, Thailand, the Philippines, Vietnam, Borneo, Egypt, India and more on cruises in 2017 and 2018. 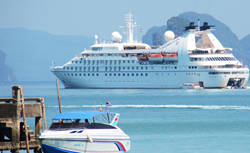 A true small ship, Windstar’s all-suite Star Legend sails to dozens of harbors in Japan, China, Thailand, the Philippines, Vietnam, Borneo, Egypt, India and more in 2017-18. In conjunction with the new Asia and Arabia cruises, the line launched the Star Perks Event with reduced fares and a choice of one free perk when booked by December 9, 2016. Free perks include a choice of up to 2 complimentary pre/post hotel nights; premium beverage package; unlimited Wi-Fi package; or up to US$1,000 shipboard credit. Star Perks Event reduced fares start at US$3,999 per guest for a 10-day Grand Japan cruise sailing either April 14 or 24, 2018. The Grand Japan itinerary sails between Yokohama (Tokyo) and Osaka, with scenic cruising and visits to Shimizu, Shingu, Kagoshima, Nagasaki, Hakata and Hiroshima, Japan; as well as Busan, South Korea. Twelve departure dates on Asia and Arabia cruises are offered from October 2017 through April 2018; book by December 9, 2016. Guest may choose from 106 suites, including 36 popular Balcony Suites with French balconies that invite cruisers to step out and enjoy ocean scenery up close; or choose one of 64 Ocean View Suites with large picture windows. Windstar suites offer more room than many hotels, with stylish décor, walk-in closets, marble bathrooms with tub or shower, top-of-the-line L’Occitane® toiletries, and a tranquil seating area with a view. Splurge on one of two luxurious Owner’s Suites just below the yacht’s Open Bridge, with a stunning view from the private veranda, living/dining room, separate bedroom, walk-in closet and marble bath. Or, engage one of four spacious Classic Suites, two forward with sweeping views, and two located near the Atrium, both with private verandas. For additional information on Star Legend, Star Perks and new Asia and Arabia cruises contact a travel professional or Windstar Cruises by phone at 877-958-7718, or visit http://www.windstarcruises.com.